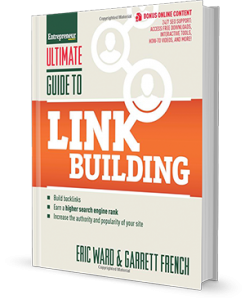 I co-authored “The Ultimate Guide To Link Building” for Entrepreneur Press. I develop linking and awareness strategies for web sites, apps, and other digital assets. I conduct link building and linking strategy workshops. I perform link audits. I create linking plans and blueprints. I provide individual consulting sessions or monthly consulting on retainer. I help manage your in-house content marketing team. I evaluate linking metrics for merger and acquisition target sites. That’s a partial list. Over the course of twenty years I’ve been involved is such a variety of linking related projects that I could write about them for days. All of these services are designed to increase awareness of -and links to- your content. I’ve been doing this since before Google existed. Over the course of that time, I’ve tuned and tweaked my approach as needed, but never relied on manipulation. The linking strategies I executed for Amazon.com in 1995 were much different than the linking strategies I executed for the 2014 Sochi Winter Olympics site and mobile apps. I work with both site owners and agencies, and I’m very selective about my clients. As a content linking strategist, I blend together online marketing, public relations, and outreach in a way that inspires and helps your site earn links, shares, and attention. I’m also a firm believer that it’s foolish to try to manipulate Google, nor rely on Google alone for your success. Search engines have made the process of content linking quite challenging. Fortunately, my approach was never based on manipulating search engines. My approach was -and is- based on people, specifically, the people and organizations who will be most likely to care about your site/content. Following this approach has also given me unique insights into what the search engines like and don’t like. The harsh reality is having a clean link profile and developing multiple linking strategies -including social- are crucial to your success. Unfortunately, many companies are confused. Money and time is being wasted on services that accomplish nothing, or even do harm. Let me help you with strategies and processes I’ve practiced and honed over 20 years working with over 1,000 sites. My services include consulting, live workshops, backlink audits, analysis and evaluation, and custom linking plans including outreach. I publish a linking strategies newsletter, and curate a web content promotion reading room with hundreds of my columns, videos, and presentations. I’ll show you how to create and deploy a natural linking strategy designed to help your content or app earn quality links and publicity. You also can learn my unique techniques and processes via training and consulting. You’ll gain an understanding of the complexity and variety of online marketing approaches. My Link building philosophy is based on experience working with hundreds of sites large and small. Over the course of that time I’ve been written about in over 150 books, magazines, newsletters, T.V., and Radio, and the services I created are used as examples in college courses on Internet marketing. Search Google for link building expert Eric Ward, and you’ll find 150,000+ results that help explain how my processes are unique, ethical, and effective. Below are short summaries of my content publicity and linking strategy services. More details about each can be found here. If you are working with more than one site or just your own, you may prefer to have me available every month for ongoing guidance and linking strategy consulting. My monthly consulting service is the best option for this. As an example, I have an agency client who represents multiple sites, and we have monthly strategy sessions where we focus on one or more of those sites each month. One month I developed a strategy for a large music festival site, and the next month I was helping them with a local zip-line adventure company site. This is my greatest strength. Give me the site, and I can put together a linking strategy that will help you succeed. A combined link building and training service, where I teach and train you on the same techniques used for my clients. I’ll create and give you link building and tracking tools you can use after we finish. I cut through all the linking rumors and inaccurate “expert” advice and maximize your investment in your site. After the Bootcamp is completed, we then continue to have one hour monthly strategy calls for six months. Not interested in the Boot Camp? I offer several other link building training services. Does my approach to link building work? Link building podcast: The written and audio transcript of the podcast between myself and Eric Enge. I maintain a running list of hundreds or articles, webinars, presentations, interviews etc., that I’ve participated in over the years. LinkMoses Link Building Articles and Advice was a very popular feature, and Ten Things to Ask Before Hiring A Company to Promote Your Web Site is an old column that still resonates today. In the dark ages I partnered with Robin Nobles and John Alexander to create an ebook titled, 131 (Legitimate) Link Building Strategies. The year: 1994. The web is catching on. But there aren’t any web promotion companies yet. So I start the first one, and ask Yahoo! founder Jerry Yang to create a new Yahoo! directory category, since none exists. Read the original 1994 email exchange between Jerry and I.